Could A 'Brain Pacemaker' Someday Treat Severe Anorexia? : Shots - Health News Neurosurgeons are testing whether electrodes implanted deep inside a patient's brain could help treat chronic anorexia. Doctors are searching for something to help in these hard cases, and a small experiment, with just a half-dozen women, is drawing attention. 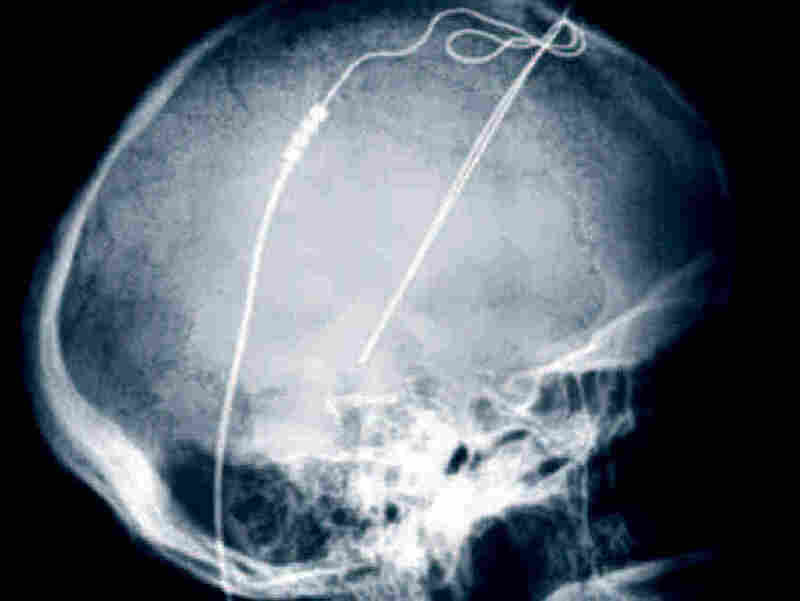 An X-ray of electrodes implanted in the brain of a Parkinson's patient at the Cleveland Clinic. 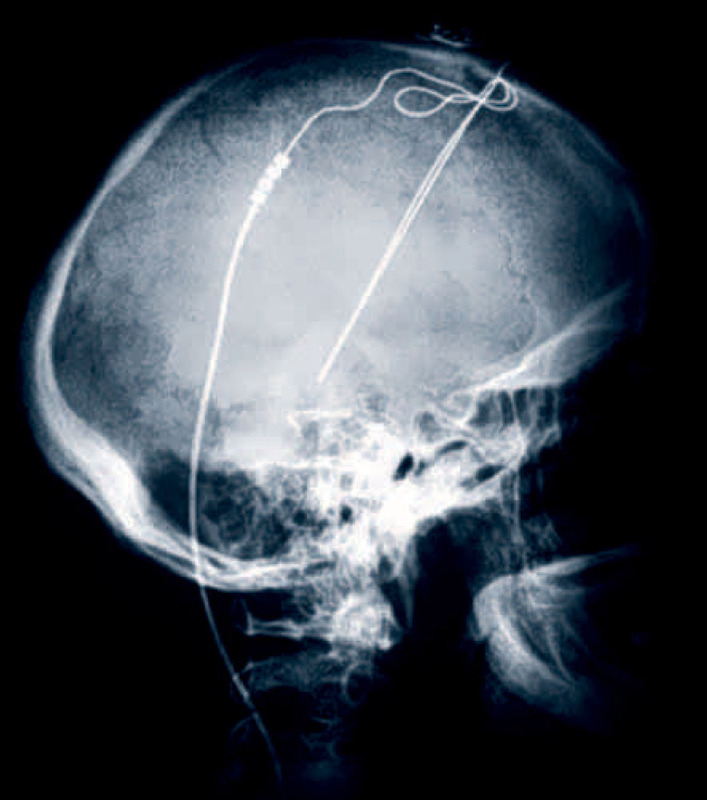 Now deep brain stimulation like this is being tried experimentally in a few patients with chronic, serious anorexia. Many people who get anorexia recover after therapy and counseling. But in about 20 to 30 percent of cases, the disease becomes a chronic condition that gets tougher and tougher to treat. Right now, doctors have few options for helping these patients, mostly women, whose disease can be crippling or fatal. "Anorexia is probably the most lethal of all psychiatric disorders," says Angela Guarda, a psychiatrist who heads the eating disorders program at Johns Hopkins. "For chronic adult patients, who have failed inpatient attempts, there isn't a clear, effective intervention." That's why a very small, exploratory study published in The Lancet Thursday is drawing attention. Neurosurgeons from the University of Toronto tried a technique called deep brain stimulation to see if it might help patients with severe anorexia. 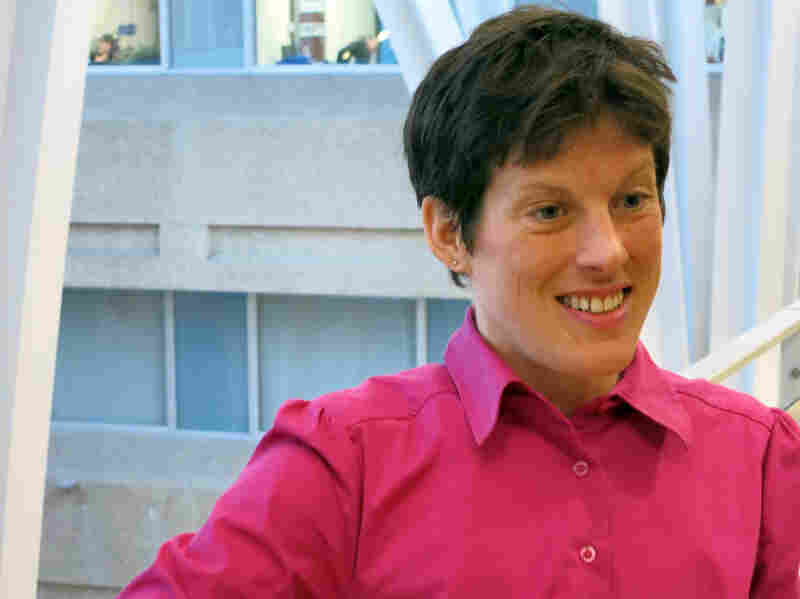 Kim Rollins of Ontario, Canada, struggled with anorexia for more than 20 years. After starting deep brain stimulation 14 months ago, the 36-year-old says she's in recovery. Guarda, who wasn't involved in the study, is quick to point out that doctors used the technique on only six patients, and just three of them gained much weight afterward. The results didn't meet the statistical tests for significance. "The technique is definitely not ready for prime time," Guarda tells Shots. "But since we don't have anything that works well for these individuals — that have a high risk of mortality – it warrants cautious optimism and further study." In deep brain stimulation, doctors implant tiny electrodes next to a region of the brain thought to be dysfunctional. A device, similar to a heart pacemaker, then sends waves of electricity through a wire to the electrodes. No one is completely sure about how deep brain stimulation works, but the thinking goes that the electrical pulses boost the activity of some neural circuits and quiet others. The Food and Drug Administration has approved this kind of treatment for Parkinson's disease, and it's being tested for some psychiatric disorders. In the latest study, neurosurgeons in Toronto implanted the electrodes in the brains of six women with chronic anorexia. Five of them had been struggling with the disease for over a decade. All of them had experienced serious health problems from it, including heart attacks in some cases. Three of the women saw improvements in their anorexia nine months after the surgery, but only two of them started to reach a normal weight. Kim Rollins from Kitchener, Ontario, was one of those successes. She had been fighting anorexia for over 20 years. After going in and out of multiple treatment programs, the 36-year-old says she was growing desperate. "My symptoms were so severe. I would wake up in the middle of night and run up and down the stairs for hours or go for a five-hour run," she tells Shots. "I became very isolated. I didn't want to be around anyone because they kept me from exercising." When she heard about the deep brain stimulation experiment, she was skeptical and scared. "It was brain surgery! But I had had a heart attack at 28 and two strokes, " she says. "My mom was in the midst of planning my funeral. If I didn't take this chance, I knew my path would probably lead to death." Fourteen months after the surgery, Rollins says she's in recovery. She's been maintaining a healthy weight, and she's less depressed. "I think it's lowered my level of anxiety a lot," she says. "I'm in a better mood. I feel better about myself and it's really helped my body image." Rollins admits that the deep brain stimulation wasn't a magic bullet. She's had to continue her anorexia treatment to get where she is. "I still see a psychiatrist regularly and a dietitian. It [the deep brain stimulation] enables me to do the work that I need to do a lot easy." Neurosurgeon Nir Lipsman, who led the study, says that's theoretically how the treatment should work. Anxiety and depression can prevent people with chronic anorexia from responding to behavioral therapies, Lipsman tells Shots. "If you are able to reduce anxiety, patients can then take advantage of therapy. It's how we could get a foot in the door for treatment." But Lipsman admits that the technique is risky and it still needs to be tested in a larger study to figure out how well it works for anorexia. It's also likely to be expensive, if it ever makes it to general practice. Deep brain stimulation can cause serious side effects, Lipsman says, like seizures, and more milder ones, like pain and nausea. "This is a brain surgery – there's no sugarcoating that," he says. "The primary objective of this study was to establish that this a safe procedure for these patients who have been quite ill before the surgery. That's all we can say right now."